Randy Mario Poffo (November 15, 1952 – May 20, 2011), better known by his ring name "Macho Man" Randy Savage, was an American professional wrestler and color commentator best known for his time in the World Wrestling Federation (WWF) and later World Championship Wrestling (WCW). He is widely regarded as one of the greatest pro wrestlers in history; a number of peers have ranked Savage among the industry's top performers of all time. Savage won 29 titles during a 32-year career. He held six world championships between the WWF and WCW, having won the WWF World Heavyweight Championship twice and the WCW World Heavyweight Championship four times, and held several other world titles in regional promotions. A one-time WWF Intercontinental Heavyweight Champion, Savage was named by WWE (formerly WWF) as the greatest Intercontinental champion of all time and was credited for bringing "a higher level of credibility to the title through his amazing in-ring performances." Aside from championships, he was the 1987 WWF King of the Ring and the 1995 WCW World War 3 winner. A major pay-per-view attraction in the 1980s and 1990s, Savage headlined WrestleManias IV, V and VIII (being part of a double main event at the last of those presentations), as well as four of the first five SummerSlam shows, the 1995 edition of WCW's Starrcade, and many other events. At the peak of his popularity, he held similar drawing power to that of Hulk Hogan. For most of his tenures in the WWF and WCW, Savage was managed by his real-life wife "Miss Elizabeth" Hulette. He was recognizable by wrestling fans for his distinctively deep and raspy voice, his flamboyant ring attire, intensity exhibited in and out of the ring, using "Pomp and Circumstance" as his entrance music, and his signature catch phrases: "Snap into a Slim Jim!" and "Oooh yeah!". Poffo was born in Columbus, Ohio, the elder son of Judy and Angelo Poffo. His father was Italian American and his mother was Jewish; Poffo was raised Roman Catholic. Angelo was a well-known wrestler in the 1950s and 1960s, who was featured in Ripley's Believe It or Not! for his ability to do sit-ups for hours on end. His younger brother is professional wrestler Lanny Poffo. He lived in Zanesville, Ohio, where he attended Grover Cleveland Middle School. He graduated from Downers Grove North High School in Downers Grove, Illinois. He later moved to Staten Island, New York, before moving to Lexington, Kentucky, where he lived for many years. Savage was signed by the St. Louis Cardinals organization as a catcher out of high school. He was placed in the minor leagues to develop, where he mostly played as an outfielder in the St. Louis Cardinals, Cincinnati Reds, and Chicago White Sox farm systems. Savage was 18 when he began playing minor league baseball; one of his teammates on the 1971 Gulf Coast League Cardinals was Larry Herndon who was also his roommate. Savage would swing a bat into a hanging car tire as a regular training exercise in order to strengthen his hands and make sure he utilized his legs during swings. The technique was so effective that Herndon adopted it and used it during his own career as a baseball coach. Savage injured his natural (right) throwing shoulder after a collision at home plate, and he learned to throw with his left arm instead. Savage's last season was 1974, when he played for the Tampa Tarpons. He played 289 games in four minor league seasons, batting .254 with 16 home runs and 66 RBIs. Savage first broke into the wrestling business in 1973 during the fall and winter of the baseball off season. His first wrestling character, The Spider, was similar to Spider-Man. He later took the ring name Randy Savage at the suggestion of his longtime friend and trainer Terry "The Goose" Stephens and Georgia Championship Wrestling (GCW) booker Ole Anderson, who said that the name Poffo did not fit someone who "wrestled like a savage". The "Macho Man" nickname was adopted after his mother Judy Poffo read a Reader's Digest article predicting that the phrase would become "the next hot term". Savage eventually decided to end his baseball career and become a full-time wrestler, working with his brother and father. He wrestled his first match against Midwest Territory wrestler "Golden Boy" Paul Christy. Savage worked with his father and brother in Michigan, the Carolinas, Georgia, the Maritimes, and the eastern Tennessee territory run by Nick Gulas. After a while, his father felt that his sons were not getting the pushes they deserved so he started the "outlaw" International Championship Wrestling (ICW) promotion in the mid-American states. Eventually, ICW disbanded and Randy and Lanny entered the Memphis scene, joining Jerry Lawler's Continental Wrestling Association (their former competitors). While there, Savage feuded with Lawler over the AWA Southern Heavyweight Championship. He also teamed with Lanny to battle The Rock 'n' Roll Express; this feud included a match on June 25, 1984 in Memphis, where in the storyline, Savage injured Ricky Morton by piledriving him through the timekeeper's table, leading to the Express winning by disqualification (though Savage's brother Lanny later said that Morton was not injured in the attack). Later in 1984, Savage turned babyface and allied with Lawler against Jimmy Hart's First Family alliance, only to turn heel on Lawler again in early 1985 and resume the feud with him over the title. This ended when Lawler beat Savage in a Loser Leaves Town match on June 7 in Memphis, Tennessee. In June 1985, Savage signed with Vince McMahon. Billed as "the top free agent in pro wrestling", Savage's first appearances on Tuesday Night Titans featured several established managers (including Bobby Heenan, Jimmy Hart, and "Classy" Freddie Blassie) offering their services to Savage. He eventually declined their offers and chose Miss Elizabeth as his new manager. His gimmick was a crazed, ego-maniacal bully who mistreated Miss Elizabeth and threatened anyone who even looked at her. He made his pay-per-view (PPV) debut at The Wrestling Classic on November 7, 1985, participating in a 16-man tournament. He defeated Ivan Putski, Ricky "The Dragon" Steamboat, and the Dynamite Kid before losing by a countout in the finals to Junkyard Dog. In late 1985, Savage started a feud with then Intercontinental Heavyweight Champion Tito Santana over that title. Santana beat him on October 19, 1985 at San Juan, Puerto Rico. The November 2, 1985 episode of Saturday Night's Main Event, he unsuccessfully challenged Santana for the title (Savage won the match by countout, but not the title because the title did not change hands by countout). In a rematch on the February 24, 1986 (taped February 8) episode of Prime Time Wrestling, he won the WWF Intercontinental Heavyweight Championship at the Boston Garden by using an illegal steel object stashed in his tights to knock out Santana. Early in his WWF career, Savage also won two countout victories in Madison Square Garden over his future tag team partner WWF World Heavyweight Champion Hulk Hogan (although the belt did not change hands due to the countout) as well as engaging in feuds with Bruno Sammartino and George "The Animal" Steele. During this time, Savage also formed a tag-team with semi-retired wrestler come color commentator Jesse "The Body" Ventura, who would remain a vocal supporter of Savage until Ventura left the WWF in mid-1990. Savage's feud with Steele began on the January 4, 1986 episode of Saturday Night's Main Event, when Steele developed a crush on Miss Elizabeth. At WrestleMania 2, Savage defeated Steele in a match to retain his Intercontinental Heavyweight Title. He resumed his feud with Steele in early 1987, culminating in two Intercontinental Heavyweight Title matches, both won by Savage. Savage wrestled Ricky Steamboat at WrestleMania III in the Pontiac Silverdome. After 19 two-counts, Steamboat pinned Savage (with help from George Steele, who pushed Savage from the top rope seconds before he was pinned) to end his near 14-month reign as WWF Intercontinental Heavyweight Champion. The match was extremely choreographed, as opposed to the "on the fly" nature of most wrestling matches at the time. Savage was a stickler for detail, and he and Steamboat laid out and rehearsed every spot in the match prior to WrestleMania, at his home in Florida. The match was named 1987's Match of the Year by both Pro Wrestling Illustrated and the Wrestling Observer. Steamboat and Savage were seen cheering with and hugging other wrestlers after the match. Savage won the King of the Ring tournament later in 1987. Savage's popularity was rising to the point that he was being cheered by a majority of the fans despite being heel, so he became less hostile towards the fans and Miss Elizabeth. When The Honky Tonk Man declared himself "the greatest Intercontinental Heavyweight Champion of all time", Savage began a feud with him to get the title back, becoming a fan favorite in the process. On the October 3, 1987, edition of Saturday Night's Main Event, he got his shot at The Honky Tonk Man and the Intercontinental Heavyweight Championship, but lost out on the title when The Hart Foundation, who along with Honky were managed by Jimmy Hart, interrupted the match, getting Honky disqualified. In the ensuing beatdown, Miss Elizabeth got Hulk Hogan to save him, leading to the formation of "The Mega Powers". Savage would lead a team of five against Honky's team of five at the first annual Survivor Series where Savage's team were victorious, avenging Elizabeth's honor and ending his feud with Honky. At WrestleMania IV, he participated in the 14-man tournament for the vacant WWF World Heavyweight Championship. He had successful matches against Butch Reed, Greg Valentine and One Man Gang, and then went on to the finals, in which he defeated "The Million Dollar Man" Ted DiBiase, by pinning him with the help of Hogan. Savage retained the WWF World Heavyweight Title for over a year, defending it against the likes of super heavyweights One Man Gang and André the Giant. The Mega Powers' main feuds were with The Mega Bucks (Ted DiBiase and André the Giant), whom they defeated in the main event of the first-ever SummerSlam pay-per-view event, and The Twin Towers, a tag team composed of super-heavyweights Big Boss Man and Akeem (formerly the One Man Gang). In the case of the latter feud, Savage frequently became involved in Hogan's matches involving one of the two villains (and vice versa); the two rival factions captained opposing teams in the main event of the 1988 Survivor Series, which was won by the Mega Powers. Problems between Savage and Hogan developed, however, in early 1989 after Hogan also took Elizabeth as his manager. At the Royal Rumble, Hogan accidentally eliminated Savage from the Royal Rumble match and they started to fight until Elizabeth separated them. On the February 3, 1989 episode of The Main Event, Savage and Hogan took on the Twin Towers in a match that saw Elizabeth accidentally get injured at ringside. Hogan carried her to the back, which enraged Savage to the point that he abandoned Hogan later in the match. Savage and Hogan got into a heated argument with Savage declaring that Hogan was an inferior wrestler to him and that he wanted to steal Elizabeth from him. He then proceeded to attack his partner, then attacked Brutus Beefcake as he tried to intervene before finally being separated by security, thus Savage turned heel once again for the first time since 1987. At WrestleMania V, Savage dropped the WWF World Heavyweight Championship to Hogan after a reign of 371 days. In April 1989, he replaced Elizabeth with Sensational Sherri. Savage would co-main event SummerSlam, teaming with Zeus, a character from Hulk Hogan's movie, No Holds Barred, against The Mega-Maniacs (Hogan and Brutus Beefcake). Savage and Zeus faced Hogan and Beefcake in a rematch contested in a steel cage at No Holds Barred and lost again. Savage adopted the moniker "The Macho King" after defeating Jim Duggan for the King of the Ring title in September 1989 (Duggan in turn had won it from Haku). On a later wrestling episode, he had a coronation as the new "King of the WWF" led by wrestler The Genius (actually Savage's brother, Lanny Poffo), in which Ted DiBiase gave him a scepter as a gift. Savage would use that scepter as a weapon numerous times. The "Macho King" and Hulk Hogan met one last time (intended to end their ongoing year-long feud), when Savage got a shot at Hogan's WWF World Heavyweight Championship on the February 23, 1990 episode of The Main Event. The pinfall was counted by new heavyweight boxing champion Buster Douglas despite Savage kicking out at two, Douglas then punched Savage in the face after Savage confronted and then slapped Douglas. Savage then began feuding with the "Common Man" Dusty Rhodes, losing a mixed tag match (along with Sherri) to Rhodes and Sapphire at WrestleMania VI but beating him in a singles match at SummerSlam. In late 1990, Savage started a feud with then WWF World Heavyweight Champion The Ultimate Warrior. The feud escalated at Royal Rumble, when Warrior refused to promise Savage the right to challenge him for the title, should Warrior defend it successfully against Sgt. Slaughter (Slaughter had already granted Savage this opportunity, should he beat Warrior). Savage had sent Sensational Queen Sherri out before the match to try to persuade the Warrior to promise this in a face-to-face interview laced with sexual innuendos, but was unsuccessful. Outraged, Savage promised revenge, which he got during the Slaughter-Warrior title match. Before the match began, "The Macho King" Randy Savage attacked the champion, resulting in the Ultimate Warrior having to crawl to the ring. Later, Savage ran out to the ring and smashed the sceptre over Warrior's head, (knocking him unconscious for Slaughter to pin), and then immediately sprinted back to the locker room. The events at the Royal Rumble led to a career-ending match at WrestleMania VII, which Savage lost. After the match, Savage was attacked by Queen Sherri as he lay dejected in the ring. This was too much for Miss Elizabeth who happened to be in the audience. Elizabeth rushed to Savage's aid, fighting off Sherri and reuniting with her one-time love to huge crowd appreciation, with Savage becoming a fan favorite once again for the first time since 1989. Despite his retirement from active wrestling, Savage stayed in the WWF in a non-wrestling capacity while The Ultimate Warrior was fired by Vince McMahon after SummerSlam later that year. Savage actually wrestled a number of times following WrestleMania VII and the WWF's official story was that out of respect, Warrior had generously allowed him to see out the final months of his contract before he was forced to retire. Savage returned to television in a non-wrestling role as the "Macho Man" after WrestleMania VII as a broadcaster. Meanwhile, the storyline with Miss Elizabeth continued, culminating with Savage proposing to her in the ring leading to an on-air wedding at SummerSlam dubbed The Match Made in Heaven. It was at this time that Savage was targeted by Jake "The Snake" Roberts, who was, by now, a villain. On an episode of Prime Time Wrestling prior to SummerSlam, the announcers and several wrestlers threw a "bachelor party" for Savage, with Roberts' arrival deemed unwelcome by the rest of the contingent. In the post-SummerSlam wedding reception, Roberts and his new ally, The Undertaker, made their presence known by hiding a live snake in one of the newly married couple's wedding presents; Elizabeth was frightened when she opened the gift box, and the Undertaker blindsided Savage by knocking him out with the urn. Sid Justice ran off both Roberts and The Undertaker. Savage, still unable to compete due to his WrestleMania VII loss to the Ultimate Warrior, immediately began a public campaign to have himself reinstated as an active wrestler to gain revenge on Roberts; however, WWF President Jack Tunney refused. Meanwhile, Roberts cut a series of promos berating Savage. The feud began to boil over during a television taping for WWF Superstars of Wrestling October 21 in Fort Wayne, Indiana, when Roberts cut an in-ring promo to goad Savage – who was providing TV commentary – into the ring. After he was lured into the ring, Roberts attacked Savage, eventually tying Savage into the ropes before getting a live king cobra to bite his arm, according to Hulk Hogan and Jake Roberts on the Pick Your Poison DVD that the snake was holding on with the fangs and that Jake had a hard time getting the snake off Randy. Sid Justice was originally supposed to be the victim of the snake bite, but due to a biceps injury, Savage accepted to be snake bitten. Savage then urged fans to lobby Tunney to reinstate him, under the rallying cry "Reinstatement! That's the plan! Reinstate the Macho Man!" In response, Tunney reinstated Savage and announced a match between him and Roberts for the This Tuesday in Texas pay-per-view event. Savage won the match, and the two continued to brawl afterward. The feud continued throughout the winter, ending after a match on the February 8, 1992 episode of Saturday Night's Main Event, which Savage won; Roberts had planned a backstage ambush of Savage and Elizabeth after losing the match, but was stopped by The Undertaker. Savage then began an on-screen feud with WWF World Heavyweight Champion Ric Flair. According to the storyline, Flair claimed that he had been in a prior relationship with Savage's wife Miss Elizabeth, going as far as presenting pictures of Elizabeth and Flair together. This culminated in a title match at WrestleMania VIII; Savage won the match and his second WWF World Heavyweight Championship. During this time, Savage and Elizabeth separated in real life, and Elizabeth made her final WWF appearance on April 19, 1992 at the UK Rampage pay-per-view, where Savage defended the WWF World Heavyweight Championship against Shawn Michaels. However, the Savage-Flair feud continued, keeping the Flair-Elizabeth television storyline intact until Elizabeth's final WWF appearance (the UK Rampage match between Savage and Michaels) aired on WWF Prime Time Wrestling in June. About this same time, WWF Magazine published photos of Savage and Elizabeth, which were identical to those featuring Elizabeth and Flair; it was revealed that Flair had doctored the Savage-Elizabeth pictures. The former couple were divorced on September 18, 1992. A statement announcing the divorce appeared in WWF Magazine at about the same time, a rare break of kayfabe for the WWF at the time; the divorce was never referenced again nor did it figure into any of Savage's future feuds for the duration of his WWF run. For the better part of 1992, Savage and his old nemesis The Ultimate Warrior (who returned to the WWF at WrestleMania VIII), peacefully co-existed. However, when it was announced that Warrior was the new number one contender for Savage's WWF World Heavyweight Championship, old tensions resurfaced and they had several heated exchanges prior to the match. Savage defended the title against The Ultimate Warrior at SummerSlam. Savage lost the match by countout, after having his knee injured by Flair and Mr. Perfect, but retained the championship. After the match, Warrior helped a badly injured Savage to the back. On the September 14 episode of Prime Time Wrestling (taped September 1), Savage lost the WWF World Heavyweight Title to Flair after an interference from Razor Ramon. He formed a tag team with The Ultimate Warrior known as the "Ultimate Maniacs" after both men were attacked by Flair and Mr. Perfect during their match at SummerSlam. After his title loss shortly after, an injured Savage backed Warrior to be the man to dethrone Flair. On the November 8, 1992 episode of Saturday Night's Main Event, they took on Money Inc. (Ted DiBiase and Irwin R. Schyster) for the WWF Tag Team Championship. Money. Inc. lost by countout but retained their title. Savage and Warrior were scheduled to face Flair and Ramon in a tag team match at Survivor Series. Warrior was fired from the WWF weeks before the event, so Savage chose Mr. Perfect, executive consultant to Flair, as his partner to replace Warrior. Perfect initially laughed off the suggestion, but was angered by Bobby Heenan and his insinuations that he could never again wrestle at his previous level, and accepted the match. Despite initial distrust (an interview prior to the match had Savage admit to Perfect that he neither liked nor trusted him), the duo defeated Flair and Ramon via a disqualification. When Monday Night Raw began in January 1993, Savage served primarily as a color commentator, wrestling only occasionally against characters such as Doink, The Repo Man, Rick Martel, and Crush. However, he was the runner up in the Royal Rumble match at Royal Rumble, where he was eliminated by Yokozuna. Savage returned to pay-per-view at Survivor Series as a substitute for Mr. Perfect and competed in the 1994 Royal Rumble match. His last WWF pay-per-view appearance as a competitor was a victory over Crush in a Falls Count Anywhere match at WrestleMania X. Savage also made periodic appearances in Jim Cornette's Smoky Mountain Wrestling promotion in fall 1994. Meanwhile, Savage was also a color commentator for the 1994 King of the Ring and made his final WWF pay-per-view appearance at SummerSlam at the new United Center in Chicago, where he served as the master of ceremonies. Before the SummerSlam PPV, Savage and several WWF superstars, including Shawn Michaels, Diesel, Razor Ramon, Bart Gunn and the 1-2-3 Kid took part in a charity softball match against the "Chicago Media All-Stars". The WWF superstars won the game 9–7 with Savage showcasing his old baseball skills by hitting a home run. At the end of October 1994, Savage's WWF contract expired and he left to sign with the competing World Championship Wrestling (WCW). On the October 31 Raw, Bob Backlund faced Lex Luger. During the match, Luger was attacked by Tatanka and Savage made the save. Later on, Savage said it was hard to sit in the announcer's chair and watch things like that happen to Luger. The following week on the November 7 episode of Raw, Vince McMahon announced that Savage had left the company thanking him for his contributions and wishing him the best of luck in the future making Halloween night the final time Savage ever appeared on WWF programming. Savage made his first appearance for WCW on the December 3, 1994 episode of Saturday Night. Savage made reference to the love/hate relationship he had with Hulk Hogan and stated his desire to be the WCW World Heavyweight Champion. Savage appeared at Starrcade later that month, saving Hogan from an attack by The Three Faces of Fear, shaking hands with his friend and rival. At SuperBrawl V, he teamed up with Sting and took on Avalanche and Big Bubba Rogers in a tag team match, which Sting and Savage won. The following month at Uncensored, Savage wrestled Avalanche with Savage getting the win by disqualification when a fan, who happened to be Ric Flair dressed in drag, attacked Savage. This led to a feud between Savage and Flair where Flair attacked Savage's father, Angelo Poffo, at Slamboree following a tag team main event where Savage and Hogan defeated Flair and Vader. Savage participated in the WCW United States Heavyweight Championship tournament and defeated The Butcher in the first round, and "Stunning" Steve Austin in the quarterfinals. and then interfered in Flair's match against Alex Wright, attacking Flair and causing Wright to get disqualified, which set up a tournament semi-final match in which the winner would face the winner of the Sting and Meng match for the United States Heavyweight Championship at The Great American Bash. Savage and Flair's tournament semi-final match never took place, however, due to Savage and Flair brawling in the backstage area prior to the match and both being eliminated from the tournament. Savage and Flair would wrestle at the event that took place on Father's Day. Savage brought out his father with him, but at the end of the match, Flair used Poffo's cane to defeate Savage. In a rematch the next month, Savage defeated Flair in a Lifeguard Lumberjack match at Bash at the Beach. Later that year, during part of the storyline in which Arn Anderson and Ric Flair turned on each other, Flair (looking for a partner to take on Anderson and Brian Pillman in a tag match) tried to recruit Savage to be his partner. Remembering the rivalry (and how Flair had attacked Savage's father), Savage refused. At World War 3, Savage won his first WCW World Heavyweight Championship by winning the first-ever 60-man three-ring battle royal. He lost the title to Flair a month later at Starrcade 1995: World Cup of Wrestling; earlier that night, he defeated Hiroyoshi Tenzan. Savage won his second WCW World Heavyweight Championship back from Flair on the January 22, 1996 episode of Nitro but re-lost the title to Flair the next month in a steel cage match at SuperBrawl VI. In January 1996, Savage brought Elizabeth with him into WCW as his manager once again, but she turned on Savage in his last title loss to Flair. Thereafter, Flair claimed that Elizabeth had given him a sizable amount of Savage's money, taken in their divorce settlement, which Flair used to set up a "VIP section" at Monday Nitro events. Flair and Savage continued to feud until June 1996, when the overall landscape of WCW changed. At Bash at the Beach, the nWo was formed when Hulk Hogan turned on Savage, Sting, and Lex Luger and joined "The Outsiders", a tag team of former WWF wrestlers Kevin Nash and Scott Hall. After their inception, one of their main enemies became Savage himself, who was one of the leaders of the WCW crusaders against the nWo. Savage threatened Hogan for months, often being attacked by the nWo. At Halloween Havoc, Savage finally faced Hogan for the WCW World Heavyweight Championship, but lost when The Giant interfered and hit him with a chokeslam. Savage left WCW following the event, when he was unable to reach a new deal with the company. Savage returned to WCW on the January 20, 1997 episode of Nitro hijacking the show, claiming to have been "blackballed" and refusing to leave the ring until Sting showed up, and the two left together. Savage appeared again with Sting over the next couple Nitro shows roving and watching events from the crowd as "free agents". At one point, Eric Bischoff informed Savage that his WCW career was over and he could only return as an nWo member. Sting and Savage appeared at SuperBrawl VII, where Savage left Sting's side and joined the nWo by helping Hogan defeat Roddy Piper. The next night, he reunited with Elizabeth, who had joined the nWo several months earlier during Savage's hiatus from WCW. Savage began feuding with Diamond Dallas Page and his wife Kimberly. Their feud lasted almost eight months which included tag team matches, a no disqualification match at Spring Stampede, a falls count anywhere match at The Great American Bash, and a Las Vegas Death match at Halloween Havoc. In early 1998, Savage started a feud with Lex Luger which culminated in a match at Souled Out, which Luger won. Luger also won a rematch between the two at SuperBrawl VIII. When Hogan failed to recapture his "nWo" title from Sting, it was Savage's turn, and he got his shot at Spring Stampede. Hogan tried to make sure that Savage would not win the title because Hogan felt that he was the only nWo member who should be WCW World Heavyweight Champion, since he was the leader of the stable. With the help of Nash, however, Savage beat Sting for his third WCW World Heavyweight Championship, despite tearing his ACL in his knee during the match. The following night on Nitro, Hogan faced Savage for the championship and it looked like Hogan had Savage beat, but for the second consecutive night, Nash came to Savage's aid, powerbombing Hogan. but an interfering Bret Hart attacked Savage and preserved the victory for Hogan. Savage then joined with Nash and others to form the nWo Wolfpac, a split from Hogan's group. Savage went on to feud with both Hart and Roddy Piper.After the June 15 episode of Nitro, Savage took a hiatus from the company to recover from at least two major knee surgeries. He made only one more appearance in 1998, helping Ric Flair defeat Eric Bischoff for the Presidency of WCW on the December 28, 1998 episode of Monday Nitro. He entered the ring wearing an nWo shirt but suddenly turned on the Giant, who was interfering on Bischoff's behalf, and removed the shirt while exiting. When Savage returned, he debuted a new look and theme music, sporting a slicked back ponytail, earrings, and a new villainous attitude (though still embracing the fans), as well as introducing his then 22-year-old girlfriend Gorgeous George as his valet. His first action was as the guest referee in the main event at Spring Stampede, which was won by Diamond Dallas Page. For a short time afterward, Savage interfered in DDP's matches to make sure that Page kept the WCW World Heavyweight Championship, but when Kevin Nash won it at Slamboree, Savage went after the title himself. It was around that time that Madusa and Miss Madness joined Savage as his other two valets; together they were known as Team Madness. At The Great American Bash, Sid Vicious returned to WCW and helped Savage to attack Kevin Nash. This led to a tag team match at Bash at the Beach between Nash and Sting against Savage and Sid Vicious, in which whoever scored the winning fall would win the WCW World Heavyweight Championship; Savage won his fourth and final WCW World Heavyweight Championship when he pinned Nash. Savage's last reign as champion did not last long, as he lost the title to a returning Hollywood Hogan the next night on Nitro, when Nash interfered and hit a powerbomb on Savage (in a reversal of the situation from the previous year, in which Nash had attacked Hogan to help Savage keep his title, albeit unsuccessfully). Team Madness slowly started to disband, after Madusa and Miss Madness began fighting each other over who was responsible for Savage's title loss. Savage soon fired both of them and started a feud with Dennis Rodman, defeating him at Road Wild. Savage was phased out of WCW programming following his feud with Rodman until the October 25, 1999 episode of Nitro, when he appeared in the ring with Gorgeous George, and talked about passing the torch forward. Following that appearance, Savage returned to WCW for one night only and joined The Millionaire's Club – a group consisting of Hulk Hogan, Ric Flair, and other veterans – aiding them at the end of a 41-man battle royal on the May 3, 2000 episode of Thunder. Despite Savage ending the show claiming he was going to help the veteran group take out young New Blood group, he never appeared again on WCW before they folded the next year. Savage made his return to professional wrestling at Total Nonstop Action Wrestling's (TNA) Victory Road by confronting Jeff Jarrett. Savage would make his Impact! debut on November 19, where he confronted the Kings of Wrestling. Savage would make one final Impact! appearance on November 26, when he showed up at the end of the show leading the force against the King of Wrestling. On December 5 at Turning Point, he teamed up with Jeff Hardy and A.J. Styles to defeat the Kings of Wrestling (Jarrett, Kevin Nash, and Scott Hall), in his last in-ring match. The main event of Final Resolution in January 2005 was scheduled to be Jarrett and Savage for the NWA World Heavyweight Championship. The plan was for Savage to win the championship and then drop it back to Jarrett at the next pay-per-view. On February 18, 2005, however, Savage left TNA due to health concerns and retired from professional wrestling. He was the celebrity spokesman for Slim Jim snack foods in the mid-to-late 1990s. His catch phrase in the ads was "Snap into a Slim Jim, oooooh yeah! ", which later became an internet meme, popularized by many gamers on YouTube. In 1998, Savage accepted an award from Harvard University's humor society Harvard Lampoon as Man of the Year. Savage appeared in many television shows in the mid-to-late 90's. He appeared on a wrestling themed episode of Baywatch that aired in 1996 with fellow WCW wrestlers Hulk Hogan, Ric Flair, Big Van Vader, and Kevin Sullivan. In 1999, he appeared on popular television shows Walker, Texas Ranger and Mad About You. Savage appeared in his first theatrical film in 2000 making an appearance as his Macho Man character in the movie Ready to Rumble where David Arquette daydreams a sequence fighting Savage at a gas station. Savage's most famous film role was in the 2002 film Spider-Man as the wrestler Bonesaw McGraw (based on the comics character Crusher Hogan). Savage's memorable voice gave him voice acting roles for various television and film projects. He voiced the rogue alien wrestler "Rasslor" in the Dexter's Laboratory shorts Dial M for Monkey. He also provided his voice in many other shows including the voice for "Gorilla" in an episode of King of the Hill and the voice of Space Ghost's grandfather in an episode of Space Ghost Coast To Coast. Savage served as the voice of "The Thug", in Disney's Academy Award nominated 2008 animated film Bolt, which was his last theatrical film appearance. Savage reprised the role in Super Rhino in 2009 for the short film featuring the cast of Bolt. Savage's music debut was on the WWF-produced WrestleMania: The Album in 1993, where he sang on the song "Speaking From The Heart", one of many songs sung by then-WWF wrestlers on the CD. Ten years later, on October 7, 2003, Savage released a rap album titled Be a Man. It includes a tribute to "Mr. Perfect" Curt Hennig as well as a diss track aimed at Hulk Hogan. Savage promoted Be A Man with a concert tour featuring Brian Adams as his bodyguard and Ron Harris as touring manager. During this time, the development of a second album was already in progress with Savage exclaiming, "We are absolutely going to have more records." However, no further albums were released. Just three months before his death on February 2, 2011, EpicLLOYD and Nice Peter made a song along with a video for Epic Rap Battles of History of Hulk Hogan, "Macho Man" Randy Savage and Kim Jong-Il having a rap battle. They noted his death with annotations in the video. Rapper Don Trip released a mixtape on January 24, 2014 entitled Randy Savage. All tracks have Savage's famous "Ohhh Yeah!!!" in the opening of the song. In January 2015, DJ/rapper DJ Cummerbund began releasing a series of remixes that feature samples from Be A Man and has received critical acclaim. He appeared in WWF WrestleMania, WWF WrestleMania Challenge, WWF Superstars, WWF WrestleMania Steel Cage, WCW Nitro, WCW/nWo Thunder, WCW/nWo Revenge, WCW MAYHEM, WWF Super WrestleMania, WWF Royal Rumble, WWF King of the Ring, WWE All Stars, as a DLC in WWE 12 and as an unlockable character in WWE 2K14. He appears as the Macho King as a DLC in WWE 2K15 and appeared in WWE 2K16. Savage's absence from WWE-licensed games was recognized by Guinness World Records in its 2015 gamer's edition as the longest such absence. Savage married Elizabeth Hulette, better known as Miss Elizabeth, in 1984. They divorced in 1992. In May 2010, Savage married Barbara Lynn Payne, who was described as his "high school sweetheart" by Terry Funk. For years, Savage and Hulk Hogan were at odds and had an on again/off again friendship. According to Hogan, Jimmy Hart, and Savage's brother Lanny, the two reconciled shortly before his death. On the morning of May 20, 2011, Savage died at age 58 after suffering a sudden heart attack while driving with his wife in Seminole, Florida. He became unresponsive and lost control of his Jeep Wrangler, crashing into a tree. Initial reports of Savage's death indicated that he had been killed in the collision, when in fact, he and his wife had been wearing seatbelts and suffered only minor physical injuries in the crash. An autopsy performed by the medical examiner's office found that he had an enlarged heart and advanced coronary artery disease (more than 90% narrowed). The drugs found in his system included a prescription painkiller and a small amount of alcohol. Savage had never been treated for heart problems and there was no evidence that he was aware of his heart condition. The cause of death was officially ruled as atherosclerotic heart disease. Savage's remains were cremated and placed under a favorite tree on his property in Largo, Florida, near his mother's development. Ten days before his death, he had asked his brother to pour the ashes of his dog in the same spot. Vince McMahon, with whom Savage had a longtime strained relationship, paid tribute to Savage in a Time magazine article, describing Savage as "one of wrestling's all-time greats." TNA held a ten bell salute in Savage's honor the night of his death. WWE aired a tribute video on the May 23 episode of Raw. Later that night, CM Punk paid tribute to Savage by wearing pink trunks and yellow boots complete with white stars on the trunks during a tag team match with R-Truth against John Cena and Rey Mysterio. Punk later adapted a version of the diving elbow drop into his moveset. In 2011, pro wrestling podcaster Peter Rosenberg stated, to agreement from veteran wrestler Shawn Michaels, that, "You add up all the things that he was capable of, and you can make a case that there was no one better than 'Macho Man'." Also that year, Kevin Eck of The Baltimore Sun lauded Savage as an all-round performer, saying that "nobody blended power, speed, agility, and technical skills like the 'Macho Man' in his prime". WWE released a DVD documentary, Macho Man: The Randy Savage Story, in November 2014. Despite a strained relationship over the years with the WWE, the documentary featured interviews with Savage's brother, Lanny Poffo and his mother, with Poffo giving insight to many of the rumors and denying some of the negative things other wrestlers said in the documentary about Savage, including his relationship with Elizabeth. Savage was never inducted into the WWE Hall of Fame during his lifetime and he was frequently described as being one of its most noticeably absent figures. On January 12, 2015, WWE announced Savage as the first inductee to the WWE Hall of Fame class of 2015, and that his Mega Powers partner and long-time rival Hulk Hogan would induct him. Savage's brother, Lanny Poffo appeared on the WWE Network that same night and commented on Savage's induction announcement by saying "I had no thoughts. I was so excited. Intellectually, there was nothing. It was all emotional. I was happy for the fans. They waited for Bruno Sammartino for so many years and now they waited for Macho Man." He went on to say that Savage's mother and his 30-year-old daughter are both very excited and said of the WWE Network, "Randy will never die." Panda, a song by American rapper Desiigner, briefly mentions Savage in a line: "Man I'm the macho like Randy". 1 2 3 4 5 6 7 8 9 10 11 12 13 14 15 16 17 18 19 20 21 22 23 24 25 26 27 28 29 30 31 32 "Randy Savage's Profile". Online World of Wrestling. Retrieved May 1, 2008. 1 2 3 4 5 6 7 8 9 10 11 12 "Randy Savage's alumni profile". WWE. Retrieved May 20, 2013. 1 2 3 ""Macho Man" Randy Savage's Professional Wrestling Hall of Fame bio". Professional Wrestling Hall of Fame and Museum. Retrieved May 21, 2011. ↑ "Randy Savage's Wrestle Data". Wrestling Data Net. Retrieved May 1, 2008. 1 2 3 4 5 6 7 8 9 "Randy Savage's Bio". Accelerator's Wrestling Rollercoaster. Retrieved May 1, 2008. 1 2 3 4 5 6 "Randy Savage's Profile". Gerweck.net. Retrieved May 1, 2008. ↑ Kilpatrick, Mike (April 10, 2014). "Who is the best Wrestler of all times?". Stuff.co.nz. Retrieved September 22, 2016. ↑ McGeorge, Alistair (January 12, 2015). "WWE Hall of Fame: Randy Savage expected to be announced as first inductee for 2015". Mirror. Retrieved September 11, 2016. ↑ "Remembering 'Macho Man' Randy Savage on Twitter". WWE. Retrieved September 22, 2016. ↑ "Wrestlemania VIII main event". WWE. Retrieved 2014-01-23. ↑ Macho Man: The Randy Savage Story (Blu-ray). WWE Home Video. 2014. Event occurs at 41 minutes. ↑ "Hogan: I Want To Induct Macho Man Into Hall of Fame". Fighting Spirit Magazine. March 21, 2013. Retrieved January 15, 2015. ↑ Vogel, Nick (May 20, 2011). "'Macho Man' Randy Savage made mark in Downers Grove before hitting big time". mysuburbanlife.com. GateHouse Media. Retrieved August 6, 2012. ↑ McNay, Don (May 20, 2011). "Memories of the Macho Man". Huffington Post. 1 2 3 4 Thomas Neumann, Teammate remembers 'Macho Man' Randy Savage, ESPN.com, May 20, 2011. Retrieved May 21, 2011. ↑ "Southeastern Wrestling News". Entertainment Weekly. August 23, 2008. Retrieved May 26, 2011. ↑ Robinson, Jon (May 28, 2004). "Randy Savage Interview". IGN.com. IGN Entertainment. Retrieved November 14, 2014. ↑ Oliver, Greg (September 15, 2011). "Lanny Poffo Q&A: Part 2". slam.canoe.ca. Retrieved September 15, 2011. 1 2 3 4 "The Wrestling Classic results". Wrestling Supercards and Tournaments. Retrieved May 1, 2008. ↑ "Saturday Night's Main Event results – November 2, 1985". WWE. November 2, 1985. Retrieved May 1, 2008. ↑ "History of the WWE Intercontinental Championship – Randy Savage (1)". WWE. Retrieved May 1, 2008. ↑ "Saturday Night's Main Event results – January 4, 1986". WWE. January 4, 1986. Retrieved May 1, 2008. ↑ "WrestleMania II official results". WWE. Retrieved May 1, 2008. ↑ "Saturday Night's Main Event results – January 3, 1987". WWE. Retrieved May 1, 2008. ↑ "Saturday Night's Main Event results – March 14, 1987". WWE. Retrieved May 1, 2008. ↑ "WrestleMania III official results". WWE. Retrieved May 1, 2008. ↑ "WrestleMania III facts/stats". WWE. Retrieved May 1, 2008. 1 2 "WWE King of the Ring Winners". WrestleView. Retrieved May 4, 2008. ↑ "Saturday Night's Main Event results – October 3, 1987". WWE. Retrieved May 1, 2008. 1 2 3 4 "Mega Powers Profile". Online World of Wrestling. Retrieved May 20, 2011. ↑ "WrestleMania IV official results". WWE. Retrieved May 1, 2008. ↑ "Randy "Macho Man" Savage vs. "Million Dollar Man" Ted DiBiase – WWE Championship Tournament Finals". WWE. March 27, 1988. Retrieved May 1, 2008. ↑ "History of the WWE Championship – Randy Savage (1)". WWE. Retrieved May 3, 2008. ↑ "Saturday Night's Main Event results – April 30, 1988". WWE. April 30, 1988. Retrieved May 3, 2008. ↑ "Saturday Night's Main Event results – November 26, 1988". WWE. September 26, 1988. Retrieved May 3, 2008. ↑ "SummerSlam 1988 official results". WWE. Archived from the original on March 31, 2008. Retrieved May 3, 2008. ↑ "Hulk Hogan & "Macho Man" Randy Savage w/ Elizabeth vs. "Million Dollar Man" Ted DiBiase & Andre the Giant w/ Virgil & Bobby "The Brain" Heenan". WWE. August 29, 1988. Archived from the original on March 27, 2008. Retrieved May 3, 2008. ↑ "Big John Studd (spot No. 27) wins the Royal Rumble Match". WWE. January 15, 1989. Retrieved May 3, 2008. ↑ "The Main Event results – February 3, 1989". Online World of Wrestling. Retrieved May 3, 2008. ↑ "WrestleMania V official results". WWE. Retrieved May 3, 2008. ↑ "Hulk Hogan vs. Randy "Macho Man" Savage – WWE Championship". WWE. April 2, 1989. Retrieved May 3, 2008. ↑ "SummerSlam 1989 official results". WWE. Archived from the original on March 25, 2008. Retrieved May 3, 2008. ↑ "Hulk Hogan & Brutus "The Barber" Beefcake w/ Elizabeth vs. "Macho Man" Randy Savage & Zeus w/ Sensational Sherri". WWE. August 28, 1989. Archived from the original on March 31, 2008. Retrieved May 3, 2008. ↑ "No Holds Barred: The Match/The Movie results". Wrestling Supercards and Tournaments. Retrieved May 3, 2008. ↑ "WWF Show Results 1989". Angelfire. Archived from the original on March 4, 2008. Retrieved May 3, 2008. ↑ "The Main Event results – February 23, 1990". Online World of Wrestling. Retrieved May 3, 2008. ↑ "WrestleMania VI official results". WWE. Retrieved May 3, 2008. ↑ "SummerSlam 1990 official results". WWE. Archived from the original on March 27, 2008. Retrieved May 3, 2008. ↑ "WWE Royal Rumble 1991". Online World of Wrestling. Retrieved March 16, 2009. ↑ "WrestleMania VII official results". WWE. Retrieved May 3, 2008. 1 2 "WWF Prime Time Wrestling Results (1985–1993)". Angelfire. Archived from the original on April 15, 2008. Retrieved May 1, 2008. ↑ "Tuesday in Texas results". Wrestling Supercards and Tournaments. Retrieved May 3, 2008. ↑ "Saturday Night's Main Event results – February 8, 1992". WWE. Retrieved May 3, 2008. ↑ "WrestleMania VIII official results". WWE. Retrieved May 3, 2008. ↑ "Randy "Macho Man" Savage vs. "Nature Boy" Ric Flair – WWE Championship". WWE. April 5, 1992. Retrieved May 3, 2008. ↑ "History of the WWE Championship – Randy Savage (2)". WWE. Retrieved May 3, 2008. ↑ "SummerSlam 1992 official results". WWE. Archived from the original on February 23, 2008. Retrieved May 3, 2008. ↑ "Ultimate Warrior vs. "Macho Man" Randy Savage for the WWE Championship". WWE. August 31, 1992. Archived from the original on March 31, 2008. Retrieved May 3, 2008. ↑ "Saturday Night's Main Event results – November 8, 1992". WWE. November 8, 1992. Retrieved May 3, 2008. ↑ "Survivor Series 1992 official results". WWE. Retrieved May 3, 2008. ↑ "Royal Rumble 1993 official results". WWE. Retrieved May 3, 2008. ↑ "Yokozuna (spot No. 27) wins the Royal Rumble Match". WWE. January 24, 1993. Retrieved May 3, 2008. ↑ "WrestleMania X official results". WWE. Retrieved May 3, 2008. ↑ "SuperBrawl V results". Wrestling Supercards and Tournaments. Retrieved May 3, 2008. ↑ "Uncensored 1995 results". Wrestling Supercards and Tournaments. Retrieved May 3, 2008. 1 2 3 "WCW United States Heavyweight Championship tournament (April – July 18, 1995)". Wrestling Supercards and Tournaments. Retrieved May 3, 2008. ↑ "The Great American Bash 1995 results". Wrestling Supercards and Tournaments. Retrieved May 3, 2008. ↑ "Bash at the Beach 1995 results". Wrestling Supercards and Tournaments. Retrieved May 3, 2008. ↑ "Randy Savage's first WCW Championship reign". WWE. Retrieved May 4, 2008. ↑ "Starrcade 1995: World Cup of Wrestling results". Wrestling Supercards and Tournaments. Retrieved May 4, 2008. ↑ "History of the WCW Championship – Randy Savage (2)". WWE. Retrieved May 4, 2008. ↑ "SuperBrawl VI results". Wrestling Supercards and Tournaments. Retrieved May 5, 2008. ↑ "Bash at the Beach 1996 results". Online World of Wrestling. Retrieved May 5, 2008. ↑ "Halloween Havoc 1996 results". Wrestling Supercards and Tournaments. Retrieved May 5, 2008. ↑ Martin, Fin. "The Complete History of Wrestling On Pay-Per-View". Power Slam. Issue 214/June 2012. p. 14. ↑ "Bash at the Beach 1997 results". Wrestling Supercards and Tournaments. Retrieved May 5, 2008. ↑ "Clash of the Champions XXXV results". Wrestling Supercards and Tournaments. Retrieved May 5, 2008. ↑ "Fall Brawl 1997: WarGames results". Wrestling Supercards and Tournaments. ↑ "Spring Stampede 1997 results". Wrestling Supercards and Tournaments. Retrieved May 5, 2008. ↑ "The Great American Bash 1997 results". Wrestling Supercards and Tournaments. Retrieved May 5, 2008. ↑ "Halloween Havoc 1997 results". Wrestling Supercards and Tournaments. Retrieved May 5, 2008. ↑ "Souled Out 1998 results". Wrestling Supercards and Tournaments. Retrieved May 5, 2008. ↑ "SuperBrawl VIII results". Wrestling Supercards and Tournaments. Retrieved May 5, 2008. ↑ "Spring Stampede 1998 results". Wrestling Supercards and Tournaments. Retrieved May 5, 2008. ↑ "History of the WCW Championship – Randy Savage (3)". WWE. Retrieved May 6, 2008. 1 2 3 "WCW Monday Nitro, Monday, 04/20/98". DDT Digest. Retrieved May 6, 2008. ↑ "nWo Wolfpac Profile". Online World of Wrestling. Retrieved May 6, 2008. ↑ "Slamboree 1998 results". Wrestling Supercards and Tournaments. Retrieved May 7, 2008. ↑ "The Great American Bash 1998 results". Wrestling Supercards and Tournaments. Retrieved May 7, 2008. ↑ "WCW Monday Nitro results, 1998". Online World of Wrestling. Retrieved May 6, 2008. ↑ "Team Madness' Profile". Online World of Wrestling. Retrieved May 7, 2008. ↑ "History of the WCW Championship – Randy Savage (4)". WWE. Retrieved May 7, 2008. ↑ "WCW Monday Nitro – Monday, 07/12/99". DDT Digest. Retrieved May 7, 2008. ↑ "Road Wild 1999 results". Wrestling Supercards and Tournaments. Retrieved May 7, 2008. ↑ "WCW Monday Nitro 10/25/99". LEGIT SHOOK. Retrieved 2015-11-04. ↑ ""Macho Man" Randy Savage". wrestlingepicenter.com. Retrieved February 13, 2014. ↑ Alan J. Wojcik. "Victory Road 2004 review". Gerweck.net. Retrieved May 7, 2008. ↑ "Turning Point 2004 results". Wrestling Supercards and Tournaments. Retrieved May 7, 2008. ↑ Alan J. Wojcik. "Turning Point 2004 review". Gerweck.net. Retrieved May 7, 2008. ↑ Reid, Shaheem (September 3, 2003). "'Macho Man' Savage Cuts Rap LP, Tells Hulk Hogan To Be A Man". MTV. Retrieved December 4, 2008. ↑ Clevett, Jason Savage turns to rap'n'wrestling SLAM! Wrestling (November 25, 2003). Retrieved 5–28–10. ↑ "The Greatest Song Of 2015 Is Here And We Have Randy Macho Man Savage To Thank For It". ctboom.com (Official site). Retrieved 20 January 2015. ↑ "Drowning Pool's 'Bodies' Gets Remixed With Rap by Late Wrestler 'Macho Man' Randy Savage". loudwire.com (Official site). Retrieved 30 May 2015. "The longest time spent away from appearing in official WWF and WWE games is an epic 16 years 4 months, achieved by “Macho Man” Randy Savage. After appearing in the Game Gear release WWF Raw in November 1994, the Macho Man wouldn’t feature in official wrestling federation games again until WWE All Stars, released in March 2011." ↑ Zengerle, Jason (December 28, 2003). "Woman in the Ring". The New York Times. Retrieved June 22, 2016. 1 2 D'Zurilla, Christie (May 20, 2011). "Macho Man Randy Savage dies after car accident; pro wrestling star was 58". Los Angeles Times. Retrieved June 22, 2016. ↑ "Terry Funk on Randy Savage". ↑ "Jimmy Hart: The Savage-Hogan Relationship, Randy's Family". 24wrestling.com. May 24, 2011. Retrieved August 6, 2012. 1 2 "Lanny Poffo Discusses The Passing Of Randy Savage". ↑ "Former wrestler 'Macho Man' Randy Savage dead after heart attack, car crash". Bay News 9. May 20, 2011. Retrieved May 20, 2011. ↑ Meacham, Andrew; Pittman, Craig (May 20, 2011). "Former wrestler Randy 'Macho Man' Savage killed in Seminole car wreck". St. Petersburg Times. Retrieved May 23, 2011. 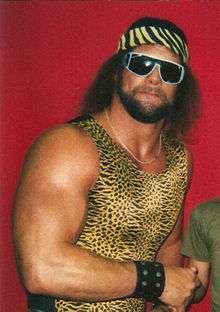 ↑ "Famed pro wrestler "Macho Man" dies in crash". Reuters. May 20, 2011. ↑ "Report: Macho Man autopsy unveiled". Fox Sports. May 23, 2011. Retrieved May 27, 2011. ↑ Keith Elliot Greenberg (May 19, 2013). "The Final Days of Randy 'Macho Man' Savage". Bleacher Report. ↑ "Randy Savage To Be Cremated + 911 Calls Released". wrestlinginc.com. May 23, 2011. 1 2 "WWE Hall of Fame again spurns Macho Man". The Tampa Tribune. March 31, 2014. ↑ "'Macho Man' Randy Savage". Time Magazine. June 6, 2011. ↑ Rowe, Jeff. "Vince's tribute to Macho Man". The Sun. May 30, 2011. Retrieved May 31, 2011. ↑ "Savage remembered around Hall of Fame weekend". Slam Sports!. Canadian Online Explorer. ↑ "CALDWELL'S WWE RAW RESULTS 5/23: Complete "virtual time" coverage of live Raw – Over the Limit PPV fall-out, Bret Hart, Savage tribute". ↑ "Vince McMahon addresses CM Punk on Stone Cold Podcast". WrestleView. December 2, 2014. Retrieved December 2, 2014. ↑ Rosenberg, Peter (September 19, 2011). "Shawn Michaels Part. 3 (4:34)". Wrestling With Rosenberg. Peter Rosenberg's YouTube channel. Retrieved January 15, 2015. ↑ Eck, Kevin (August 4, 2011). "Top 10 favorite wrestlers of all time". The Baltimore Sun. Tribune Publishing. Retrieved January 15, 2015. ↑ "DVD Review: 'Macho Man: The Randy Savage Story'". philly.com. November 27, 2014. Retrieved December 19, 2014. ↑ "WWE Power Rankings: Rock takes top spot". ESPN. January 29, 2013. Retrieved January 13, 2015. ↑ "'Macho Man' was a true original". Post and Courier. May 22, 2011. Retrieved January 13, 2015. ↑ "The cream rises to the top: 'Macho Man' Randy Savage to be inducted into WWE Hall of Fame". ↑ "Lanny Poffo on Randy Savage in the WWE Hall of Fame". Pro Wrestling Insider. January 12, 2015. Retrieved January 13, 2015. 1 2 3 World Championship Wrestling (1997-04-06). "DDP Vs. Randy Savage". WCW Spring Stampede. 1 2 3 4 World Championship Wrestling (1997-06-15). "DDP Vs. Randy Savage". WCW Great American Bash. 1 2 3 World Championship Wrestling (1997-09-14). "DDP & Lex Luger Vs Randy Savage & Scott Hall w/ Elizabeth". WCW Fall Brawl. 1 2 3 4 5 6 7 8 Macho Madness – The Randy Savage Ultimate Collection (DVD). WWE Home Video. 2009. ↑ "Jimmy Hart profile". Online World of Wrestling. Retrieved September 4, 2009. 1 2 "WCW Mayhem: The Music at Allmusic". ↑ "The PWI Awards". Pro Wrestling Illustrated. 33 (3): 86. 2012. ↑ "Pro Wrestling Illustrated (PWI) 500 for 1992". The Internet Wrestling Database. Retrieved January 13, 2015. ↑ "Pro Wrestling Illustrated's Top 500 Wrestlers of the PWI Years". Wrestling Information Archive. Retrieved March 26, 2009. ↑ "Pro Wrestling Illustrated's Top 100 Tag Teams of the PWI Years". Wrestling Information Archive. Retrieved March 26, 2009. ↑ "Randy Savage's fourth WCW World Heavyweight Championship reign". Wikimedia Commons has media related to Randy Savage.